In early 2017, analysis of the AppSource.com telemetry revealed a potentially significant problem with the landing experience on AppSource.com, which was launched prior to my time partnering with the team. 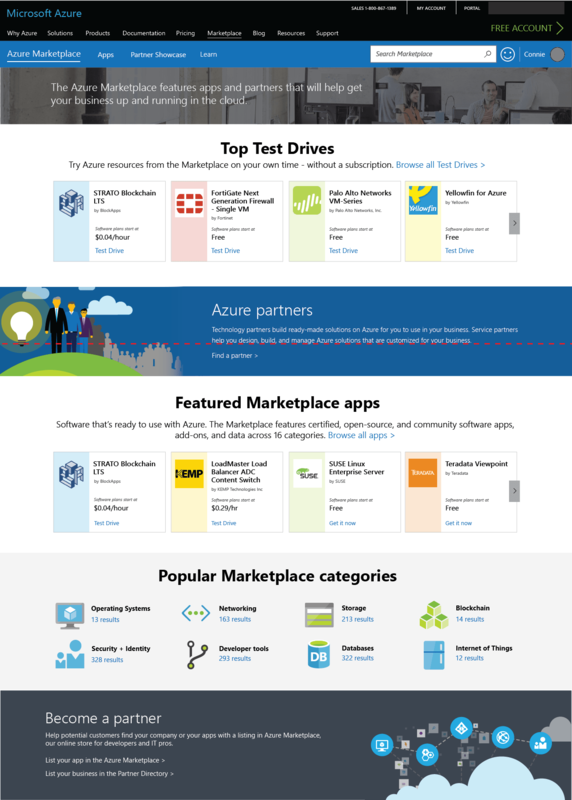 In partnership with our marketing and merchandising product managers, I worked to help both the AppSource and Azure Marketplace teams develop a roadmap for improving the landing experience. 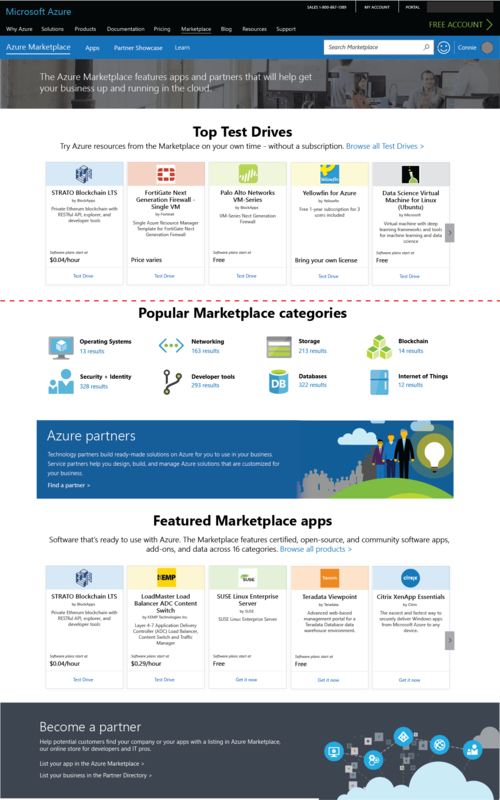 Since both AppSource.com and Azure Marketplace are driven by the same underlying marketplace framework, problems from both sites are indicated below. For this effort, I was the primary designer with assistance from another designer on my team during the later half of the process. I worked closely with a design prototyper and our research team, in addition to 3-4 product managers. 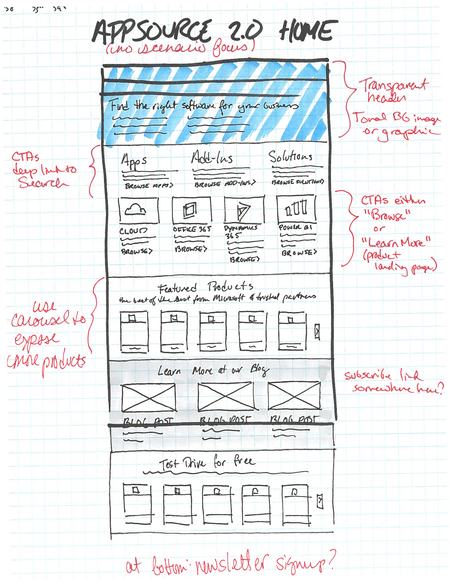 My partners on the product team were risk-averse when we discussed at the wireframe level, but were far more open to early discussions when centered around sketches. Thus, I focused on rough sketches to narrow down an initial testing plan, with the intent of fostering open conversations at the correct level. 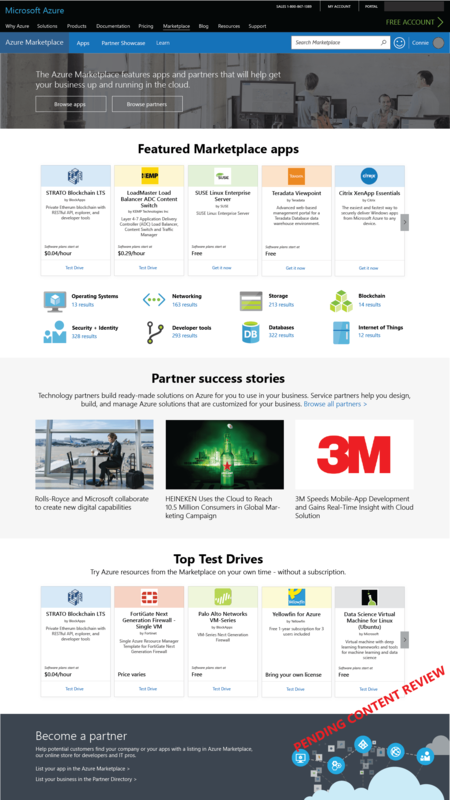 After viewing the home page, do customers understand the role AppSource plays as a MSFT software marketplace? Can targeted merchandising reduce the need for Search? 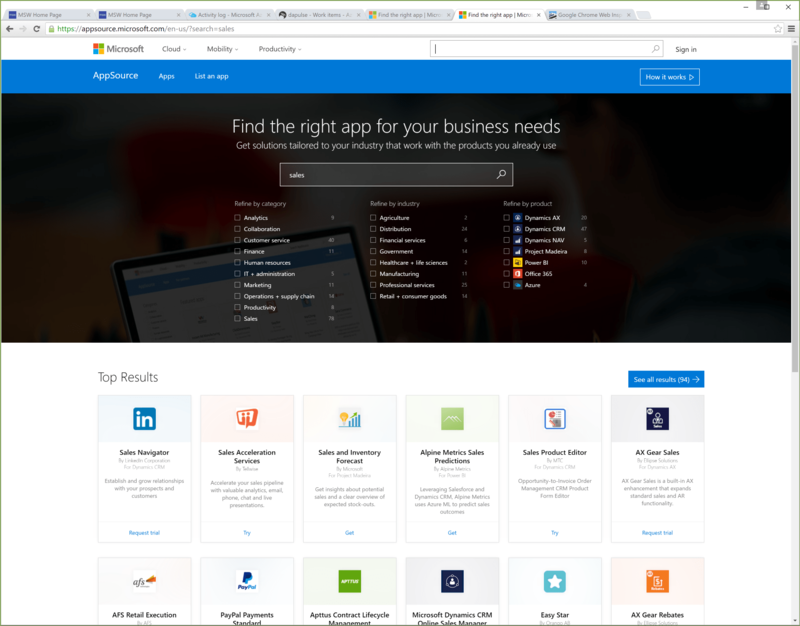 Can customers who still desire to use Search find the core Search experience? Our initial research based on an interactive prototype (which also included search and gallery functionality) indicated that the expanded merchandising and visual treatment for Search did result in increased engagement, but further affordances were necessary for category browse links that led to search results. 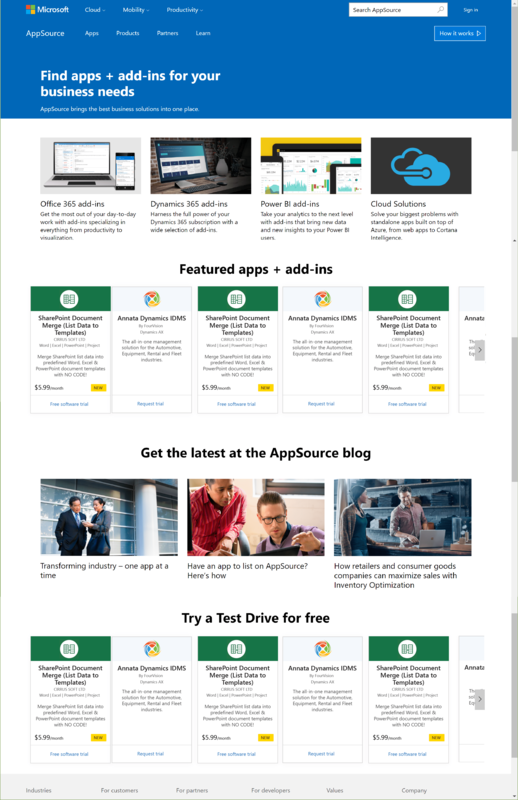 We iterated and re-tested with several changes, and following a second successful test delivered redlines for the new AppSource Home Page. 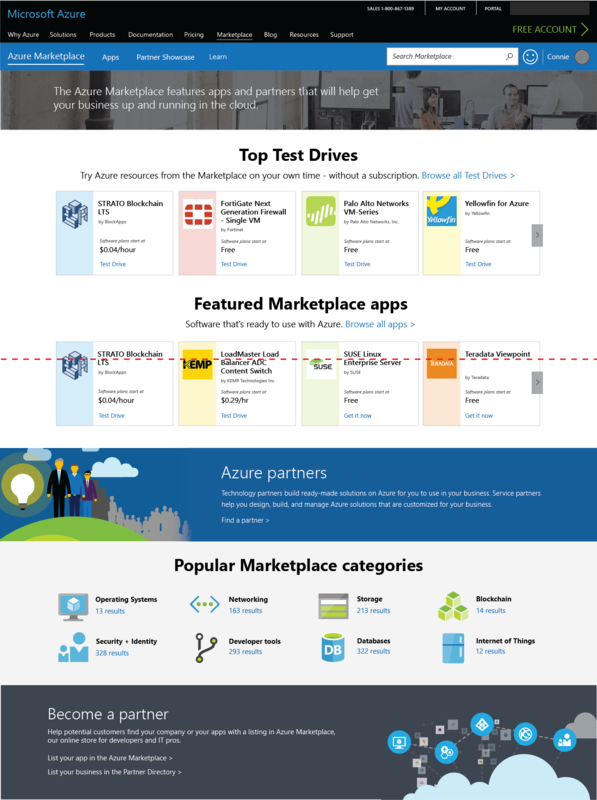 Around the time that we finalized the AppSource Home plan of record, project management decided that they would prefer to launch first with a homepage for Azure Marketplace, which was perceived as lower risk due to lower MAU. Per PM request, greater emphasis for categories to draw from inspiration from competitor sites. We continued to iterate on this design, validated it in several tests in parallel with gallery improvements, and scrubbed the design in partnership with our content designer. We were also unfortunately forced to use custom styling instead of Microsoft Web Framework controls, which caused responsiveness regressions that must be dealt with in the future once the team has dev resources to roll their own solution.